Join the 24,500+ others that receive AMAZING recipes in their inbox each day! It's FREE! These No-Bake Cheesecake Bites are easy, delicious, and almost too good to be true. Everything you love about cheesecake, made into a bite size treat! If you want to talk about love at first sight, let’s talk about these No-Bake Cheesecake Bites! They are so simple to make and taste amazing. I love cheesecake in any form, so a no-bake bite that doesn’t require a mixer and only has 5 ingredients? Yes, please! The cheesecake center is creamy, smooth and sweet and the graham cracker crumbs give it that distinct cheesecake taste. They are dipped in chocolate which takes them over the top and makes them even better, if that’s possible. These No-Bake Cheesecake Bites come together so fast- the most time consuming part of this recipe is letting the cheesecake batter chill. What I like to do is mix them and let them chill overnight, then scoop and dip them the next day. If you don’t have that much time, 1 hour minimum will work. I like using a cookie scoop so all the bites are the same size. I just spray it with non-stick spray and scoop. I found that I also had to roll them in between my palms to get perfectly round balls. If you love cheesecake then you will love these! 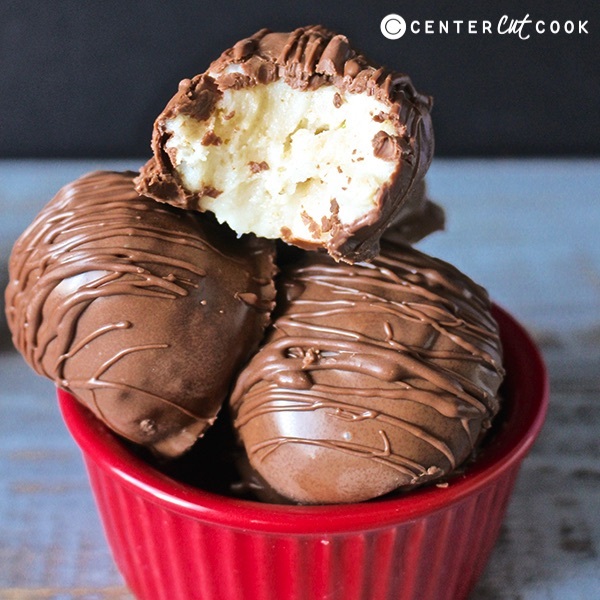 No-Bake Cheesecake Bites are easier than regular cheesecake and just as delicious. They are best served cold, just like traditional cheesecake. In a large bowl, mix the cream cheese and butter together until combined. Add in the graham cracker crumbs and mix well. Add in the powdered sugar, 1 cup at a time, until it is all mixed in. Cover and chill in the fridge for at least 1 hour. I usually let it sit overnight. Place a piece of wax paper on the counter and remove batter form the fridge. Scoop into balls and roll in between palms if necessary. Place on wax paper. Place in fridge for 10-20 minutes if they are too soft to dip. Melt the chocolate in the microwave, stirring every 15 seconds to make sure it doesn’t harden up. It should take about 1 minute for the chocolate to completely melt. 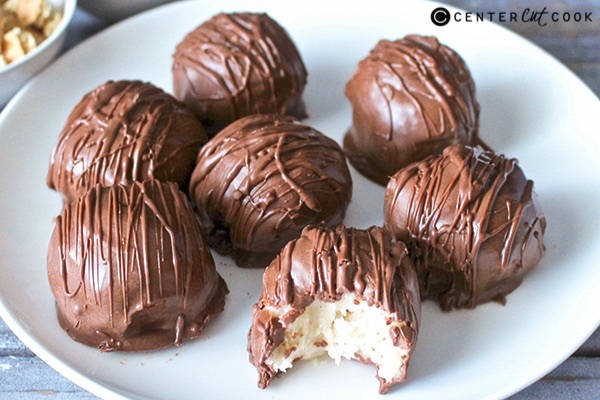 Dip balls into chocolate, covering completely. Place back on wax paper and let cool until chocolate has hardened. Store in the fridge for the best taste.